Was introduced on film businnes by his uncle Louis Kolb, who was first a sound technician and later head of the electrical department at MGM. Louis took his seven year-old nephew over to “Fox Ranch,” now Century City, to spend his Saturdays wandering through film stages. Once de Cuir had watched the filming of “Ben-Hur” (the 1925 version), and later quietly observed from behind the camera the work of John Barrymore, Jeannette McDonald, and William Powell, his career choice was sealed. The Bride of Frankenstein(35) The adventures of Marco Polo(38)Ali Baba & The Seven Thieves(44). he also worked at Universal matte department under Russell Lawson. 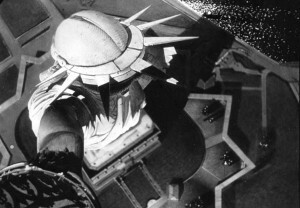 De Cuir also worked on Hitchock’s and Bob Boyle´s “Saboteur” as an optical matte artist during this first phase of his career. At middle 40´s he begun his art director carrer. He got eleven nominations and won three times the Academy Award as best art direction for “The King and I”, “Cleopatra” and “Hello, Dolly”. De Cuir was an exceptional illustrator an painter, and with his matte painting background, he used to collaborate painting glasses on his films, like at “Cleopatra”, where he helped matte painter Emil Kosa Jr with the huge painting of Alexandria. Posted on 27 November, 2013 by Domingo Lizcano. Permanent link.